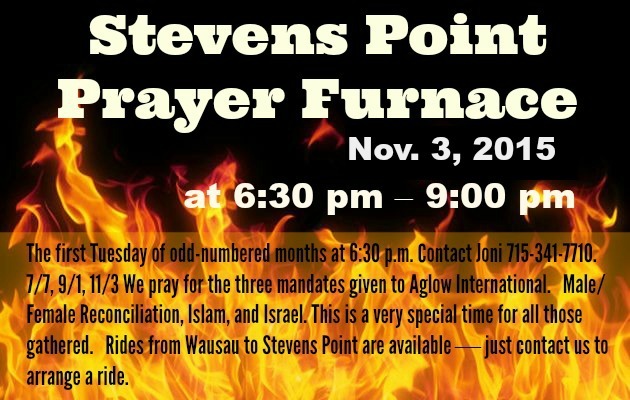 Stevens Point Prayer Furnace: The first Tuesday of odd-numbered months at 6:30 p.m. Contact Joni for location. We pray for the three mandates given to Aglow International. Male/Female Reconciliation, Islam, and Israel. This is a very special time for all those gathered. The warmth of the group, the music, the testimonies brought forth, and the personal ministry offered, set our hearts aflame for God’s people. Rides from Wausau to Stevens Point are available from Kim or Kathy — just contact us to arrange a ride. December 5th – Christmas luncheon: Each Lighthouse should have received your invitations. Invite others from your Lighthouses – It’s a good way of getting new people involved. It will be held at the Country Springs Hotel 2510 Golf Road, Pewaukee WI (map) from 11 am to 2 pm. $20 per person. Please RSVP & send your checks by Nov 20th to Marlene Paprocki. Lighthouse Leadership Development: Please put February 13th on your calendar for an LLD at the Waukesha Bank in Oconomowoc. (map) It’s been awhile so please make every effort to come and pray for good traveling weather. More details to follow. Spring Retreat: Please put April 22-23 on your calendar for the Spring Retreat at Green Lake Conference Center. More information to follow. Tues, Oct 20, 2015 at 6:30 p.m. Following Yeshua Jesus means taking time to tend to people whom society has generally forgotten, including those behind bars. The unexpected death of the youngest of the Neumann family has opened up a door to ministry to those who are not only lost—but also hidden. 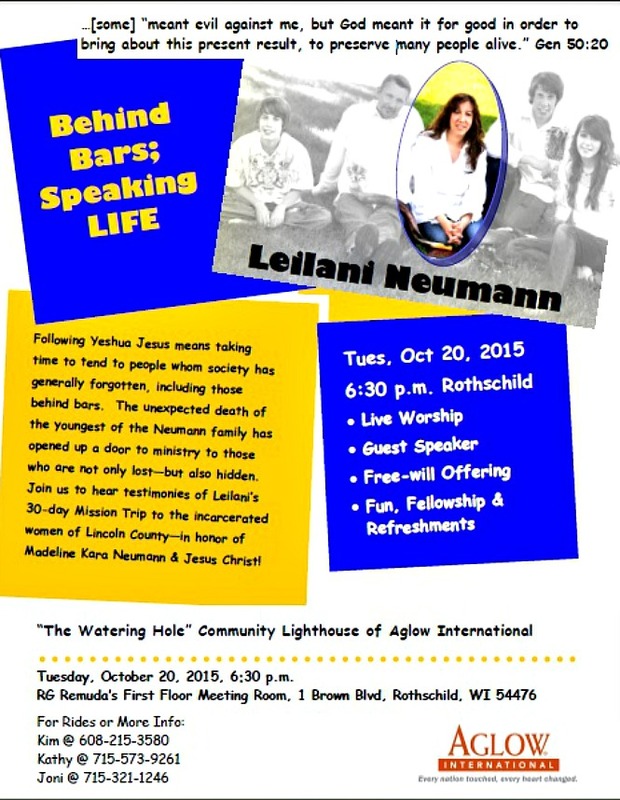 Join us to hear testimonies of Leilani’s 30-day Mission Trip to the incarcerated women of Lincoln County—in honor of Madeline Kara Neumann & Jesus Christ! Our prayer focus varies – Our Lighthouse mission is to pray for local churches in the area. 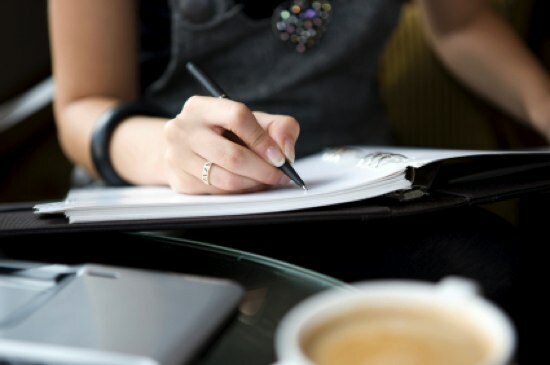 In the past 12 months alone we have interceeded for some the following: support staff in churches (secretaries, janitors, musicians, etc), the people who aren’t able to attend church (handicapped, shut-ins), the people in the church, programs (VBS,…Sunday School, women’s retreats, schools attached and/or supported by area churches) Our topic for prayer is whatever the Lord lays on our hearts when we meet. We are seeing God move as we have interceeded for our area, to God. We believe that area includes Paddock Lake to Elkhorn, and from the State Line to East Troy. The call in this Lighthouse is worship and intercession. We pray for all the Aglow Mandates (with an emphasis on Israel), for families… and for all God puts on our hearts. We welcomed and prayed for the Men who attended today! Cheryl Sanders, Area Team President/Southern Wisconsin was the Speaker for Aglow International West Bend’s 25th Anniversary Celebration today. Amy Volkert, Generations Coordinator for the North Central Region and Dana Enright the North Central Regional Director at the 25th Anniversary of the West Bend Lighthouse. Linda Curry part of Aglow International Southern Wisconsin Area Team praying a blessing over all the Men who attended West Bend’s 25th Anniversary Celebration. Barb Rich today at the Aglow International West Bend 25th Anniversary Celebration!